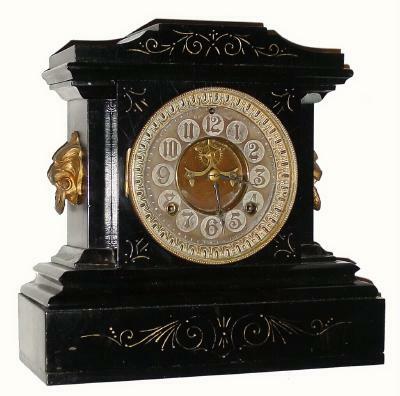 C.1890, Ansonia Clock Co., "La France", with open escapement, and in generally good condition. The iron case has been touched up and nicely polished, and some one has added an aluminum base to it (about 3/8 inch), and installed an Ingraham pendulum, also has a coffee can lid for rear cover. This clock retains its original hard rubber dial, though the silver background of the numerals is now replaced by the white residue of dried polish. The rubber dials (and even rubber cases for a while) were an effort by Ansonia to reduce shipping damage. The few mentioned items can be corrected with replacement parts from Timesavers, and the bonus is it has high line damascene plated movement. Height 11.25 inches with base.